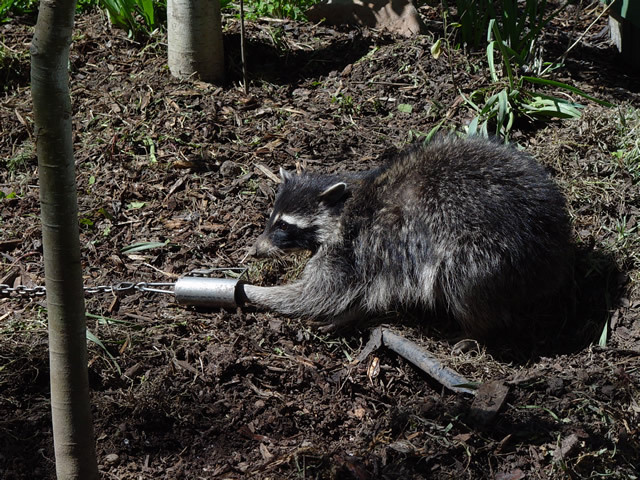 Raccoon trapping can be done both indoors and outdoors. 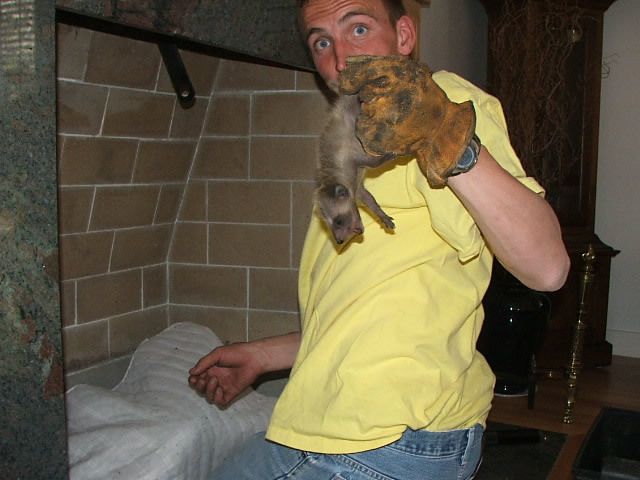 Here is a technician performing raccoon removal from a chimney. 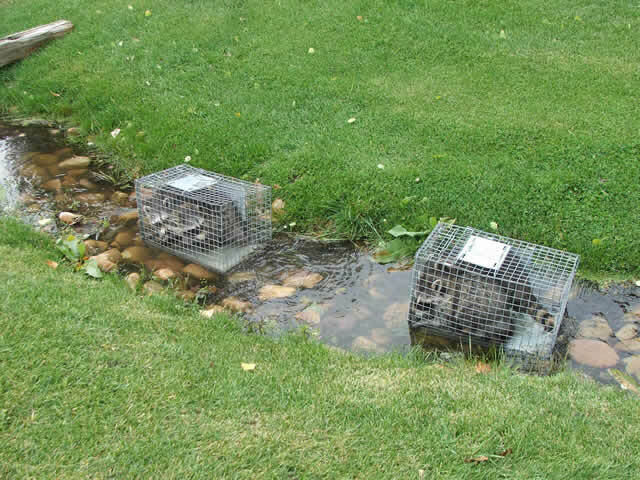 Raccoon traps must be sturdy enough to contain a 50 pound beast. 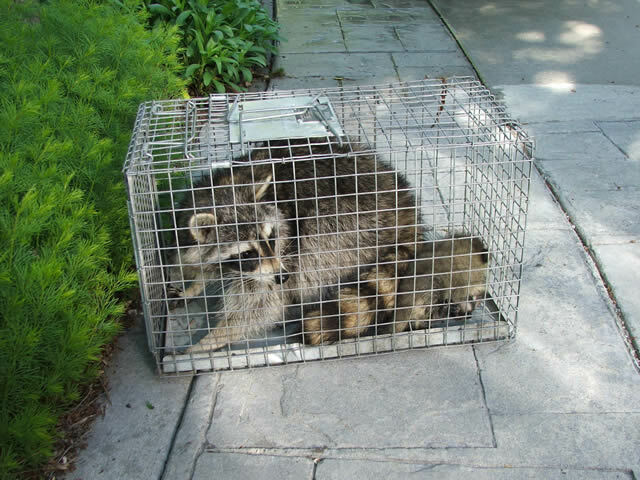 Contact a professional raccoon removal specialist in your area. 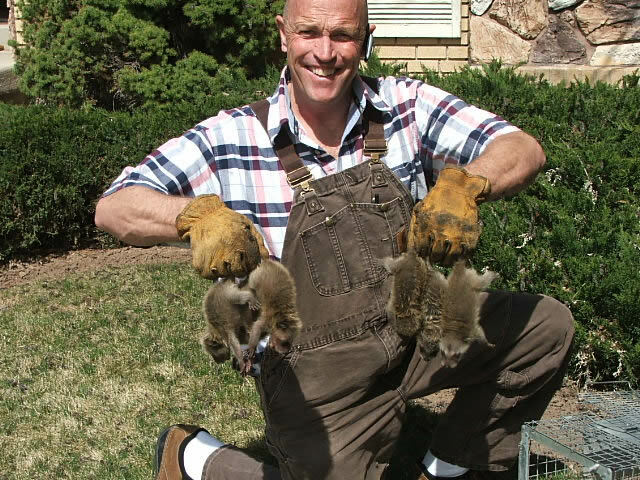 It always amazes people when my technicians and I remove six, seven, eight, or even twelve raccoons from their attic, when they thought that all they had was one or two. These are social critters with family groups, and finding fairly large numbers of them sharing the same living space is not at all unusual. In fact, multiple raccoons together is more often the case than not. A mother will look for a safe, dry place to have her babies, such as an attic or chimney, and den up there. It doesn't take long for baby raccoons to become big, and the more you have, the more frustration you will experience. Wait for the raccoon to leave, then seal off the entrance. The problem with this is that there may be babies involved that you didn't know about. 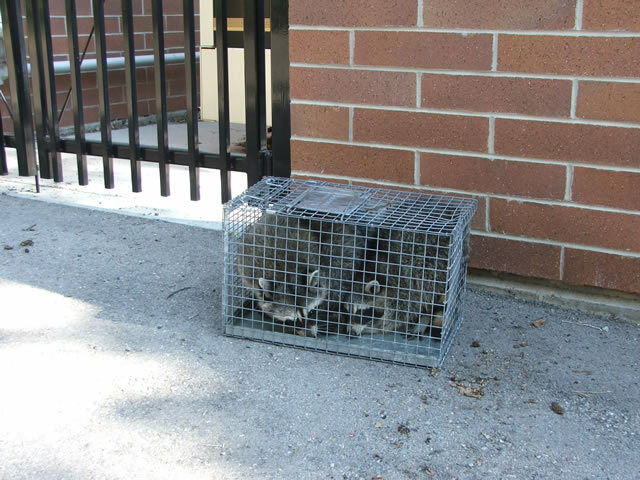 The main reason raccoons take up shelter inside buildings in the first place is to make a den for their young, so the odds of little ones being trapped inside are high. Once mom is excluded, the babies are on their own to wander around the attic, falling into wall cavities or under insulation where they die and rot. Now there is a new problem, and dead raccoon removal is necessary. Live animals are always easier to work with than dead ones and you will likely end up paying more for this kind of project than if you had called a professional to begin with. Smoke it out of the chimney. Raccoons commonly make nests inside chimneys and raise young there. Sometimes people try to take care of this problem by lighting a fire and smoking the animals out. While this cruel method may get the adult to leave, it will not remove the babies that are too young and weak to climb out. Then you have dead baby raccoons in your chimney, smelling up your house and breeding maggots. Usually when I see this, the homeowners had no idea babies were there. These ï¿½masked banditsï¿½ are trying animals because they are quite fearless. It is difficult, if not impossible, to drive them away. Loud noises and bright lights do not faze them. Even if you face off with them, they will be nonplussed. They are not easily intimidated. I also hear a lot of complaints about scratching, growling, or fighting noises from the attic, or thumping sounds on the roof. People tell me that their pet dogs are upset, pet food has disappeared, and that they or their neighbors have seen raccoons in the area. Frequently these sounds and sightings occur in the evening or at night. While noises, scattered trash, and missing pet food are annoying, they are the lesser part of the problem. Raccoons are notoriously destructive and filthy. They can rip apart your soffits and woodwork, tear up your lawn, and will leave feces everywhere they go. If they are inside your attic or garage for very long at all, you will probably have to replace your contaminated insulation and perhaps even some of the sheetrock, because of the urine stains. They also routinely damage duct work and wiring. Naturally, they leave behind raccoon feces which can contain Raccoon Roundworm spores and, if inhaled, will seriously sicken humans. 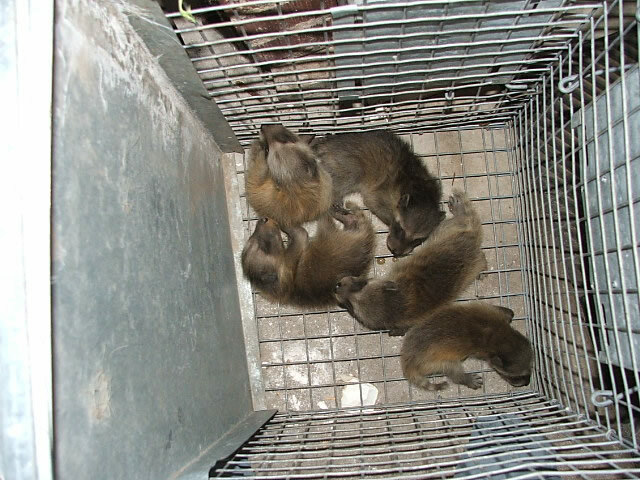 They are capable of carrying rabies and canine distemper. All of these pose serious risk to any people or pets that enter your property. It is wise to stay away from any wild animal you encounter. Sometimes my clients know they have an animal in their attic but they are unsure what it is. I can tell simply by looking at the opening if the culprit is raccoon. They will create a large access opening for themselves, destroying soffits and woodwork, and usually leave big, muddy footprints. In their natural habitat, raccoons prefer hollow trees or dense vegetation. We get many calls about raccoons in attics and raccoons in chimneys, because in urban environments these locations are close substitutes for that hollow tree. We also get many complaints about raccoons in crawlspaces, raccoons in walls, in garages, barns, and underneath porches. Some people estimate that their population density is ten times higher in urban areas than in the wild, because humans provide so much of what they need. They are intelligent and adaptable creatures. Raccoons are easily recognized by their black eye mask and ringed tail. They are excellent climbers and have nimble fingers, similar to a monkey's. The footprints they leave behind look like a small human hand print, with a palm and long fingers. Adults can grow quite large, reaching a size of over 40 pounds. They do not respond to rodent poisons nor are there any specific raccoon poisons. Poisons should not be used to control raccoons. My technicians and I can honestly say that we have never seen a nuisance wildlife animal job that we were unable to do. 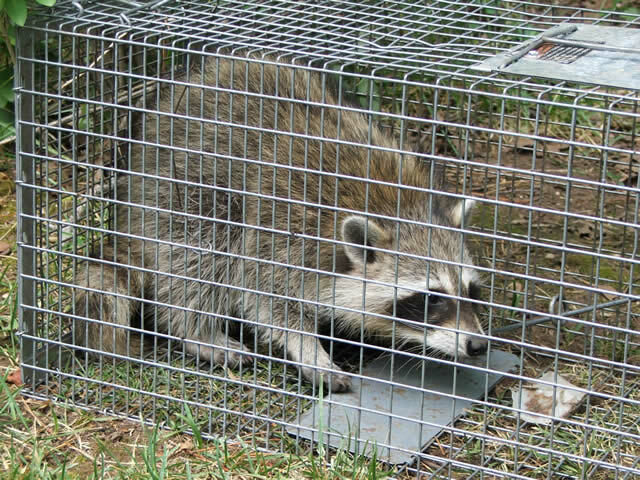 We have professional equipment for trapping raccoons and many years of experience that enable us to provide comprehensive animal control . Not only do we perform removal of nuisance animals, we also do cleanup, decontamination, and home repairs. You may send us 5 to 10 digital pictures of your raccoon problem and we will give you a FREE cost estimate over the phone. For fastest services, call us today at . Prices will vary depending on the severity of the problem and on the time spent on the job. Remember, raccoons can be unpredictable animals. Every infestation is unique and our solution will be custom fit to your situation. Check with your insurance for coverage. 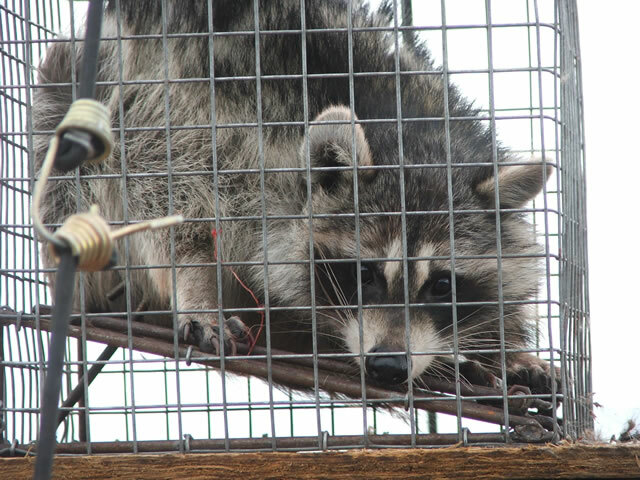 Read more about this pest animal at our Raccoon FAQ. We also offer expert coaching services for a fee, so you can do raccoon removal yourself. We can even ship the necessary traps, lures, etc. to you. Baby raccoons are cute, but they quickly grow up to become big pests. This family of raccoons was living in an attic. 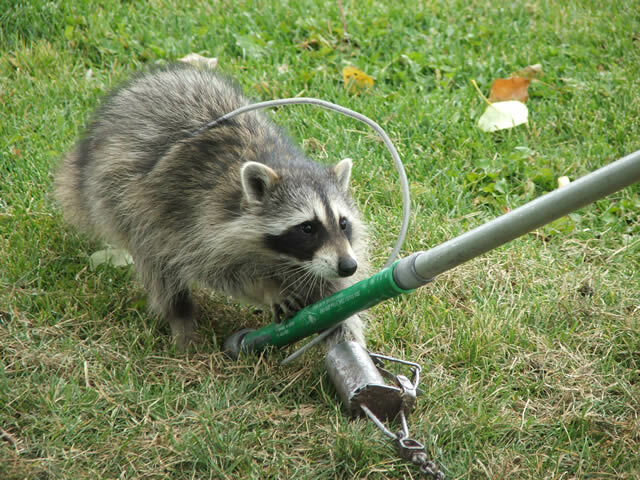 An experienced nuisance wildlife removal operator will know how to get rid of raccoons for you. Getting rid of raccoons is important to your safety and health. 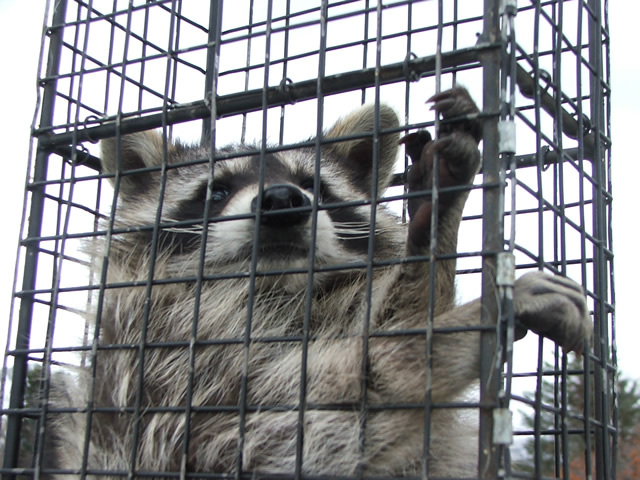 Raccoon extermination should be done humanely. Raccoon poisons are not available. 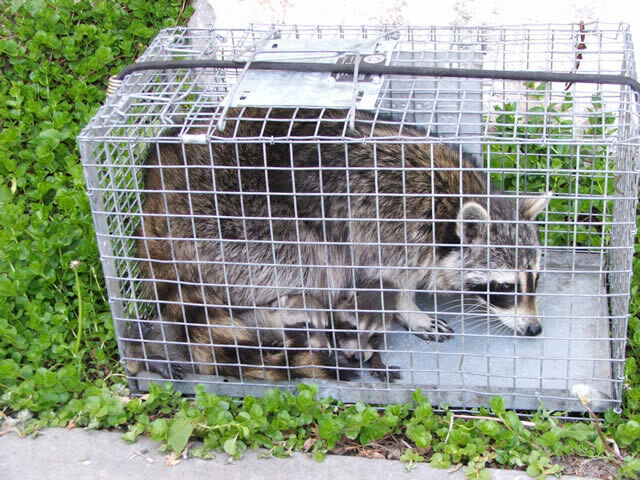 Trapping is the way to get rid of raccoons.